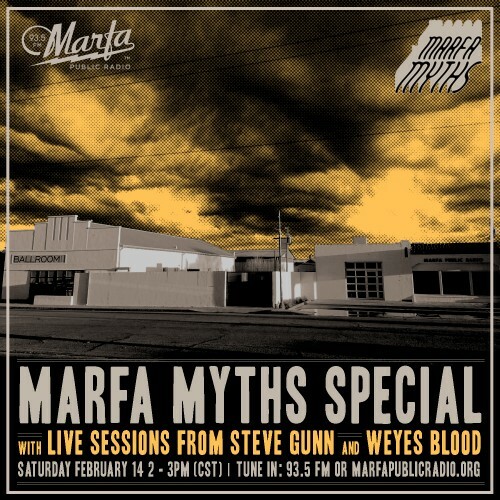 This weekend, musicians, artists and aficionados of independent music are traveling from across the country and descending on Marfa for the “Marfa Myths” music and arts festival. Thursday, March 12, 6:30 PM – Jefre Cantu-Ledesma joins us on-air to talk about his music and his “Sound Bath” installation at The Well in Marfa. Friday, March 13, 6:30 PM – Matt Papich, aka Co La, talks about his sample-based electronic recordings, and his work with the Brooklyn-based record label Software Recording Co.
Saturday, March 14, 2 – 3 PM – Daniel Chamberlin of Inter-Dimensional Music hosts an hour of free-form radio featuring music, interviews and live performances with artists on the Marfa Myths lineup, including Steve Gunn and Weyes Blood. Tune in at 93.5 FM in Far West Texas – 91.7 FM in Alpine – or stream us online here. Follow us on Twitter and Facebook for photos from the scene all weekend. Last year’s festival featured underground musicians Quilt, Connan Mockasin, Weyes Blood and No Joy, among others. For this year’s festival, Mockasin and labelmate Weyes Blood return to Marfa, joined by musicians and sound artists whose work ranges from the minimalist, drone-influenced sound portraits of Jefre Cantu-Ledesma, to the John Fahey and Sandy Bull-inspired folk-rock stylings of Steve Gunn. This entry was posted in KRTS News and tagged art, Ballroom Marfa, marfa, Marfa Myths, Mexican Summer, Music, Music Festivals, Software Recording Co., The Well, Visual Arts, West Texas Talk. Bookmark the permalink.